In order to be able to optimise existing processes, technical qualifications, actions to be taken and roles must be known and tasks and functions of the stakeholders assigned. The assessment of the process for nZEBs depends strongly on the perspective. Building owners, investors, tenants, the construction industry, providers of energy efficiency solutions and planners have different interests and are involved in different phases in the life cycle of buildings. There is a general lack of understanding, transparency and uniform methods when it comes to the overall process of nZEBs. Which costs and time horizons are significant for different actors and to what extent? In addition to legal and urban boundaries, buildings are essentially defined by the client. Owners or investors want to construct or renovate buildings for a specific purpose. Also, the buildings technical quality and the comfort standard have to be achieved within project specific budget limitations. Architects and specialised planners translate the client’s ideas and wish into real plans and are responsible for the appropriate execution of the building project. Construction companies and craftsmen from numerous different disciplines are involved in constructing the building. The recently published report “D5.1: Typology canvas of business models” covers the development and detailed description of a methodology for the analysis of business models (BMs) within the framework of nZEBs. 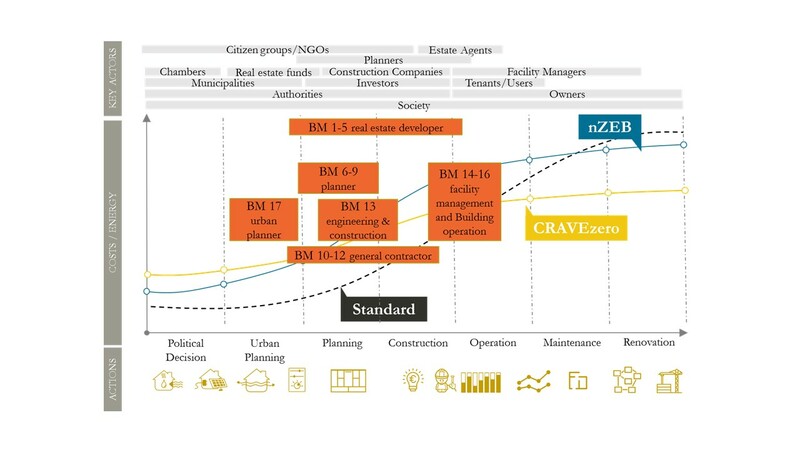 With this methodology the CRAVEzero project partners were able to describe, validate and evaluate their own BMs. The analysis comprises a total of 17 BMs. They are bundled and their main characteristics are provided and compared according to the Business Model Canvas.